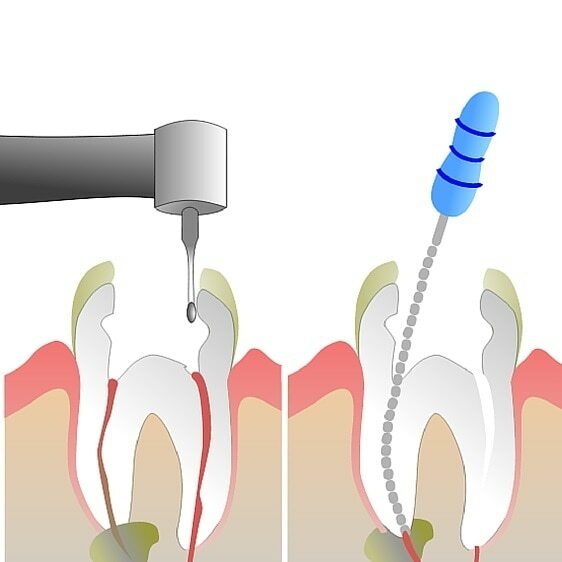 Root canal treatment is a technique designed to preserve and conserve a natural tooth which is either infected to the pulp or has a non vital pulp following a trauma or persistent chronic carious infection. The roots of the teeth have running canals which carry the vital tissue of the tooth termed as the PULP. In case of deep carious infection the pulp gets exposed and we need to clean these canals bearing the pulp to get rid of the infection. Hence, the term root canal treatment. For a very long time clinicians have been doing hand root canals which is an inefficient and time consuming procedure. We at Dhawan dental care believe in precision and accuracy. With the help of our latest digital RVG which helps us in the radio diagnosis and our NSK automatic Endomotor and Orikam French rotary pulp cleaning files, our root canals are 99.9% accurate, require mostly one appointment of 30 to 40 minutes and requires minimum intervention of the natural tooth structure. Minimum cavity opening is prepared to access the canals as compare to conventional procedure which requires excessive preparation and the Bio-mechanical preparation of the canals are completely packed and in tune with the artificial canal filler required to maintain the integrity and density of the saved tooth.